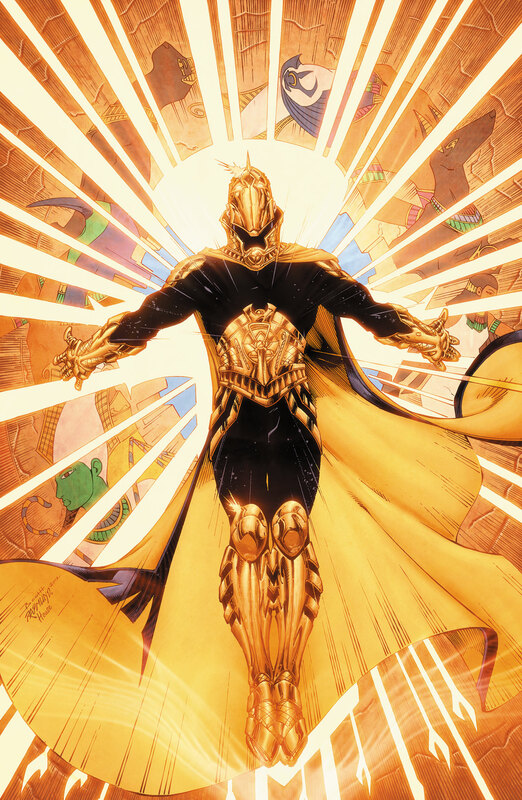 When we last left Jay and Khalid in the pages of Earth 2, they were searching the Tower of Fate for the helm of Nabu while Wotan held Jay’s mother hostage. Can Jay fight off the beast that lives within the tower? Can Khalid find the Helm of Nabu without losing his own sanity? Will Mrs. Garrick survive Wotan? This action-packed story has at least some of those answers…and it continues with the level of quality we’ve come to expect from this excellent series. SOME SPOILERS AHEAD! DO NOT READ FURTHER UNTIL YOU HAVE READ THE ISSUE! As the story begins we learn more about Wotan in the New52. In the pre-Flashpoint DCU, Wotan has been written alternately as male and female. In the New52, Wotan has lived as both…just in different lifetimes. She began as a female witch, and her first battle with Nabu ended rather badly…with a spell permanently changing her skin to green so that Nabu would be able to recognize her in future lifetimes. If you wonder why Wotan isn’t too thrilled with Nabu…that may explain part of it. As for Jay and Khalid, the duo are on the run from the beast that guards the Tower of Fate…and we see more of the everyman-turned-hero aspect of Jay Garrick. I am enjoying this depiction of Jay, as we watch him mature before our eyes. He may not have asked for his powers, but he gladly takes on the responsibility that goes with them. In the meantime, there is an aside with Steppwolf and Fury, with a one-page revisit to that gatefold cover surprise. I’ll come back to that in a moment…but…Khalid continues the search for the Helm of Nabu, inspired by the bravery he has seen in Jay Garrick’s fight against the beast. To find out how that turns out, you’ll need to read the issue. James Robinson has written another excellent issue for this series, which is easily one of the better titles in the New52. Nicola Scott and Trevor Scott do another amazing job on pencils and inks, with colors from Alex Sinclair and Pete Pantazis. The overall look of this series is exceptional, and this issue certainly maintains that high standard. As for the gatefold surprise…while I’m thrilled to see the particular characters who are revealed this way, the feel of the gatefold covers this month across the DC New52 seems to be more stunt than true story development. The mystery character (and company) only appear on one page in the story. Even though this isn’t the last we will see of these characters, it seems a bit of a stunt to sneak them into a “What the Fifty-Two” cover and then have only a cameo appearance inside the book. However, that is likely a DC Editorial direction rather than a specific choice from Robinson and company, so I’ll give that a pass and will simply be glad to see these characters in the New52. Other than that minor complaint, this was an exceptional issue, and certainly worth the price of admission. SUMMARY: Once again, an excellent issue of Earth 2, one well worth the read. As I have written before, if you aren’t reading Earth 2 you are truly missing out! This entry was posted in Reviews and tagged doctor fate, Jay Garrick, JSA, The Flash, Tower of Fate, Wotan on April 7, 2013 by Ed Garrett.